Bed bug sprays are dangerous to your health and are also ineffective. Find out why you should avoid using a bed bug spray if you’re on the hunt for a bed bug treatment option. Most people who discover a bed bug infestation race out to the nearest hardware store in a desperate search of an over-the-counter solution – usually in the form of a poisonous bed bug sprays. And who can blame them? Bed bugs are nasty little critters that can be extremely difficult to eradicate, yet what a lot of people don’t realise is that the solutions that are designed to remove these bed bugs are often doing more harm than good. You see, not only are bed bug sprays often ineffective – they can also be hazardous to your health. 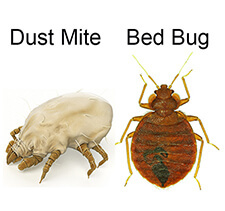 In reality, they are best avoided in favour of more natural bed bug treatment options. The Centres for Disease Control and Prevention (CDC) released a report in 2012 detailing the health concerns about misuse of pesticides for bed bug control, which pointed out that many bed-bug related enquiries received by the National Pesticide Information Centre (NPIC) involved incidents of pesticide exposure, spills, or misapplications. According to the CDC, incorrect exposure (over-application or misapplication – ie using outdoor sprays indoors) can hurt your family’s health, contaminate your home, result in the loss of your belongings if they become contaminated, and cost thousands of dollars to clean up your house to make it safe to reoccupy. In order for chemical sprays to be effective, they need to be reapplied over time – often months. As well as being costly, this results in increased exposure at home. Many bed bug sprays and bed bug solutions are ineffective – largely due to their limited application. Bed bug sprays can’t be used in power points, nor can they reach underneath carpets, so they are unable to completely eradicate bed bugs. They also risk spreading bed bugs to other locations in affected areas. Increasing evidence is indicating that bed bugs are becoming resistant to many chemical solutions and sprays. Bed bugs reproduce rapidly, so without a solution that can guarantee 100% removal, efforts to kill the bed bugs are always going to be unsuccessful. Looking for a more natural bed bug solution? Bed Bug Killer is Australia’s only eco-friendly DIY instant and long-term bed bug treatment. Find out more about how Bed Bug Killer can help to get rid of bed bugs naturally here. Let’s say you ignore all those health risks and even the fact that your house will definitely stink for a long time, but it will be for nothing because those sprays don’t kill all bed bugs because, as you said, they can’t reach all areas. Your Bed Bug Killer is the most effective thing I tried and the fact that it didn’t cost me an arm and a leg it makes it even more awesome. Thanks for providing a non toxic bed bug treatment. I hated the thought of using toxic chemicals in my bedroom. You can also add to the list that many of them smell really bad and the smell seems to stick to everything for months. That plus the fact that they don’t seem to actually get rid of the bugs they seem pointless to me. Bed bug sprays are a big no-no in our house because I have asthma. I’ve used some natural remedies like bean leaves and noticed some improvements but didn’t manage to get rid of them for good. I will try your DE product and see if it works for me as well. Bean leaves are good but they stop working as soon as they start to wilt. Bed Bug Killer powder is much more effective because it lasts for many years to kill bed bugs.